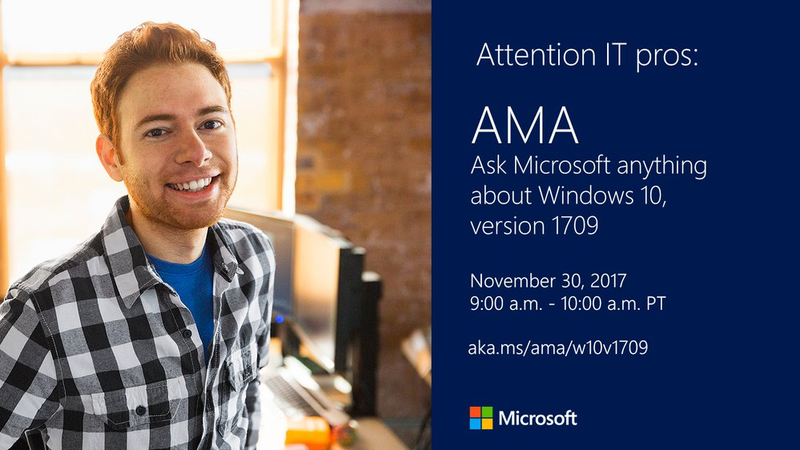 Join us on November 30th for an opportunity to "Ask Microsoft Anything" (AMA) about Windows 10, version 1709 (aka the Windows 10 Fall Creators Update). The AMA will take place from 9:00 AM to 10:00 AM Pacific Time in the Windows 10 space. Members of the engineering and product teams will be standing by to answer your questions and listen to your feedback about the latest Windows 10 feature update. Don’t miss this chance to get answers to your questions. Add the event to your calendar. We hope to see you there! Can’t attend at 9:00 a.m. Pacific Time? While we’ll only be answering questions in real time from 9:00-10:00 a.m. Pacific Time, you can post your questions for the AMA to the Windows 10 space in the Windows 10 Tech Community up to 24 hours in advance. Just make sure you add a tag for “Windows 10 v1709 AMA” so that we can find them easily.